Put 1 Tablespoon Hisbiscus Flowers in Tea Holder. Use Stainless Steel Tea Infuser. Let sit for 15 minutes and remove infuser. After cooling a bit, put 2 of the cups of hibisicus water in a blender. Add apple (sliced) and the juice of 2 lemons. Blend well. Strain tea through nut milk bag or cheese cloth. Mix with the other 3 cups of tea. Add ice and enjoy. If you have a juicer, you can juice the apples & blend. No straining needed. Delicious & fun drink that is both thirst quenching & healthy for hot summer days. It has Hibiscus Flowers, Apple, Lemon and a small amount of Stevia to sweeten. It is not only a beautiful, impressive drink, but delicious, fun and healthful. Kids and adults alike will love its taste, and the drink is a healthy alternative to high-sugar fruit punches. 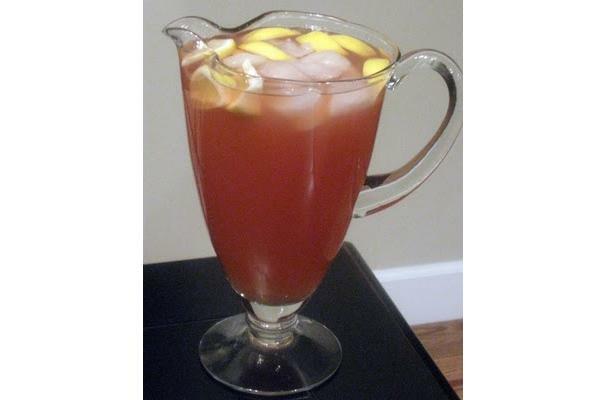 The punch has a vibrant, deep-red color that makes it look like traditional fruit punch.